He’s done it again! Chef Jamie Purviance has delivered another mouth-watering, juice dripping down your hands, saucy classic in our newest cookbook Weber’s Big Book of Burgers. If the cover doesn’t get your juices flowing, flip through a few pages and see all of the amazing burgers, sausages, and hot dogs filling the pages. For those who have been in the Weber family for a long time you will see a character, Burger Guy, making appearances throughout the book giving you some fun facts throughout the book. 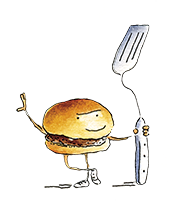 Burger Guy was a reoccurring character in our Grill Out Times® back in the 90’s and we are happy he has joined us for another adventure. Check out our Extreme Burgers, Shrimp Burgers with Remoulade or Patagonian Hot Dogs with Avocado Mayo right here at https://bigbookofburgers.weber.com/ to whet your appetite and then order yourself a copy or download an ebook! Enjoy and be sure to let us know what you think of the book and what your favorite recipe is!